Here, we describe a case of primary graft failure with severe sepsis in a boy who experienced frequent relapses of osteosarcoma. The patient had undergone haploidentical bone marrow transplant after engraftment of unrelated cord blood transplant performed 10 months earlier. Considering his severe condition, we transfused autologous peripheral stem cells along with a single dose of etoposide (50 mg/m2). Granulocyte engraftment was confirmed on human leukocyte antigen-microsatellite analysis of bone marrow on day 14. Although the patient died due to respiratory failure, transfusion of autologous hematopoietic stem cells is a reasonable rescue option for graft failure even in patients whose background hematopoiesis is reconstituted by a first donor. Graft failure is a serious complication of allogeneic stem cell transplant (allo-SCT), which requires retransplant as an emergency life-saving measure.1 Allogeneic hematopoietic stem cells (HSCs) are more commonly used for rescue intervention than autologous HSCs.2,3 Although a graft-versus-leukemia (or tumor) effect is not expected, autologous HSCs are considered safer as a rescue source, as an additional conditioning regimen is generally not required.4 In recent years, a second or even third allo-SCT transfusion is being increasingly performed in patients with relapsed malignancies after engraftment of primary allo-SCT.5 In these patients, because background hematopoiesis is already reconstituted by primary allo-SCT, autologous HSC transfusion for graft failure is regarded to have a limited advantage. Here, we report the case of a boy who showed granulocyte engraftment after rescue transfusion of autologous HSCs for graft failure of second allo-SCT under the circumstances that his hematopoiesis had been reconstituted by the primary allo-SCT donor. A 12-year-old Japanese boy was diagnosed with osteosarcoma of the proximal right tibia. Because the tumor was resistant to conventional chemotherapy (cisplatin, doxorubicin, and high-dose methotrexate), the patient received adjuvant chemotherapy, including high-dose ifosfamide and cisplatin. Considering that the viability of tumor cells in the amputated leg was as high as 80%, an autologous peripheral blood stem cell (auto-PBSC) transplant with a conditioning regimen of intravenous etoposide (250 mg/m2) on days -7 to -3 and carboplatin (300 mg/m2) on days -6 to -3 was administered after resection of bilateral lung metastases. However, 9 months after auto-PBSC transplant, multiple lung metastases were newly confirmed on computed tomography scan. The patient received unrelated cord blood transplant (uCBT) from a KIR-ligand-mismatched male donor with serologically HLA 1 locus mismatch using a nonmyeloablative conditioning regimen of intravenous fludarabine (30 mg/m2) on days -10 to -6, total body irradiation (400 cGy) on days -5 and -4, and intravenous melphalan (40 mg/m2) on days -3 and -2. Engraftment was confirmed by micro­chimerism analysis. After a transient decrease in size, his lung metastatic lesions showed regrowth 4 months after the uCBT. Infusion of recombinant interleukin 2 failed to show a significant antitumor effect. An additional 4 courses of chemotherapy, which included docetaxel, etoposide, and ifosfamide, induced a partial response. Subsequently, a second allo-SCT using the haploidentical bone marrow of his father was performed 10 months after the uCBT. Serologic disparities of HLA were 2 and 3 loci for graft-versus-host and host-versus-graft directions, respectively. With consideration of the patient’s poor renal and cardiac functions, a nonmyeloablative regimen of intravenous fludarabine (30 mg/m2) on days -6 to -2, intravenous antithymocyte globulin on day -6 (2.4 mg/kg) and on day -5 (1.6 mg/kg), total body irradiation (300 cGy) on day -4, and intravenous melphalan (40 mg/m2) on days -3 and -2 was administered. In addition, 6.7 × 108 cells/kg of unmanipulated bone marrow mononuclear cells were transfused. Prophylaxis for graft-versus-host disease consisted of tacrolimus and short-term methotrexate. On day 20 before engraftment, the patient developed severe sepsis due to Trichosporon species (Figure 1), which is a potentially fatal complication in SCT recipients. Granulocyte-colony stimulating factor-primed granulocytes (1.2 × 107 cells/kg body weight) retrieved from his father were transfused. However, the patient developed acute respiratory distress syndrome, which required mechanical ventilation and continuous hemodiafiltration. 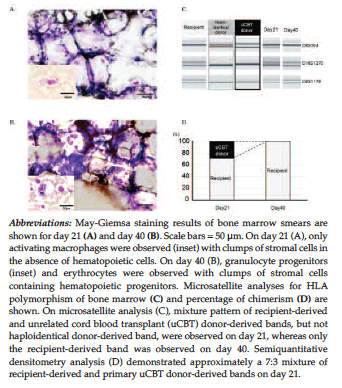 Bone marrow smear on day 21 (Figure 2A) showed scattered activated macrophages with clumps of stromal cells in the absence of hematopoietic cells. Together with an elevated serum ferritin level (Figure 1), a tentative diagnosis of posttransplant hemo­phagocytic syndrome was made, and etoposide (50 mg/m2) and methylprednisolone pulse therapy were administered. Microsatellite analysis of bone marrow on day 21 (Figure 2, C and D) failed to identify any sign of donor-derived hematopoiesis but showed a mixture (7:3) of recipient-derived and primary uCBT donor-derived bands. This suggested that the stromal cells and activated macrophages were of recipient and uCBT donor origins, respectively. Rescue allo-SCT was not considered as an option due to the poor condition of the patient after Trichosporon infection and acute respiratory distress syndrome. Thus, to control severe sepsis, 1.6 × 108 auto-PBSCs (1.4 × 106 CD34+ cells/kg body weight), which had been cryopreserved as a backup for primary uCBT, were transfused in 4 divided doses on days 26 to 29, after additional administration of etoposide (50 mg/m2) on day 26 to control activated macrophages. On day 36 (10 days after start of transfusion of auto-PBSCs), granulo­cytes began to appear on the peripheral blood smear. The bone marrow smear on day 40 (14 days after rescue auto-PBSC transplant) (Figure 2B) showed recovered granulopoiesis and erythropoiesis. Microsatellite analysis revealed 100% recipient type (Figures 2, C and D). Granulocyte counts of peripheral blood were > 100/μL and > 500/μL on days 52 and 55 (26 and 29 days after rescue auto-PBSC transplant), respectively (Figure 1). However, acute respiratory distress syndrome became gradually aggravated despite the recovery of granulopoiesis, and the patient died on day 58 (32 days after rescue auto-PBSC transplant) with the following blood counts: 2410/μL of white blood cells, 2000/μL of granulocytes, 0.23% of reticulocytes, and 4000/μL of platelets. The transplant of bone marrow stromal cells from the same donor has been shown to prevent graft failure of allo-SCT.6 Consistent with this, recent clinical trials of cotransplant of donor-derived mesenchymal stem cells in haploidentical SCT demonstrated accele­ration of engraftment.7,8 These observations suggest that a matched immunologic background of HSCs with that of stromal cells confers an advantage for engraftment. In this context, it is assumed that bone marrow stromal cells in our patient were of recipient origin at the time of graft failure of second allo-SCT (ie, 10 months after primary uCBT). Two previous reports demonstrated that mesenchymal stem cells of bone marrow remained of recipient origin in most allo-SCT recipients, regardless of donor sources,9 even after an extended time (median of 8 years) after transplant.10 Thus, although there have been no previous reports, autologous HSCs could be an option for rescue transfusion in cases of graft failure after second allo-SCT. Indeed, engraftment of granulocytes (> 500/μL) was confirmed in our case 29 days after initiation of transfusion of auto-PBSCs, although engraftment of erythrocytes and platelets was not confirmed because of early death of the patient due to progression of acute respiratory distress syndrome. In conclusion, transfusion of autologous HSCs is a reasonable rescue option for graft failure of second or third allo-SCT, even in patients whose background hematopoiesis is reconstituted by the first allo-SCT’s donor. Wolff SN. Second hematopoietic stem cell transplantation for the treatment of graft failure, graft rejection or relapse after allogeneic transplantation. Bone Marrow Transplant. 2002;29(7):545-552. Fuji S, Nakamura F, Hatanaka K, et al. Peripheral blood as a preferable source of stem cells for salvage transplantation in patients with graft failure after cord blood transplantation: a retrospective analysis of the registry data of the Japanese Society for Hematopoietic Cell Transplantation. Biol Blood Marrow Transplant. 2012;18(9):1407-1414. 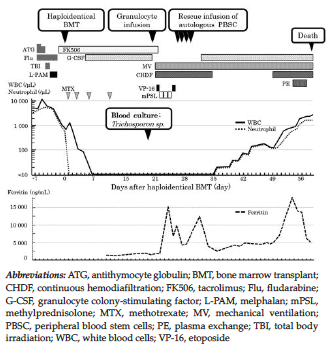 Pottinger B, Walker M, Campbell M, Holyoake TL, Franklin IM, Cook G. The storage and re-infusion of autologous blood and BM as back-up following failed primary hematopoietic stem-cell transplantation: a survey of European practice. Cytotherapy. 2002;4(2):127-135. Mehta J, Powles R, Singhal S, Horton C, Treleaven J. Outcome of autologous rescue after failed engraftment of allogeneic marrow. Bone Marrow Transplant. 1996;17(2):213-217. Gassas A, Ishaqi MK, Afzal S, Dupuis A, Doyle J. Outcome of haematopoietic stem cell transplantation for paediatric acute lymphoblastic leukaemia in third complete remission: a vital role for graft-versus-host-disease/ graft-versus-leukaemia effect in survival. Br J Haematol. 2008;140(1):86-89. Ishida T, Inaba M, Hisha H, et al. Requirement of donor-derived stromal cells in the bone marrow for successful allogeneic bone marrow transplantation. Complete prevention of recurrence of autoimmune diseases in MRL/MP-Ipr/Ipr mice by transplantation of bone marrow plus bones (stromal cells) from the same donor. J Immunol. 1994;152(6):3119-3127. Le Blanc K, Samuelsson H, Gustafsson B, et al. Transplantation of mesenchymal stem cells to enhance engraftment of hematopoietic stem cells. Leukemia. 2007;21(8):1733-1738. Ball LM, Bernardo ME, Roelofs H, et al. Cotransplantation of ex vivo expanded mesenchymal stem cells accelerates lymphocyte recovery and may reduce the risk of graft failure in haploidentical hematopoietic stem-cell transplantation. Blood. 2007;110(7):2764-2767. Garcia-Castro J, Balas A, Ramirez M, et al. Mesenchymal stem cells are of recipient origin in pediatric transplantations using umbilical cord blood, peripheral blood, or bone marrow. J Pediatr Hematol Oncol. 2007;29(6):388-392. Rieger K, Marinets O, Fietz T, et al. Mesenchymal stem cells remain of host origin even a long time after allogeneic peripheral blood stem cell or bone marrow transplantation. Exp Hematol. 2005;33(5):605-611.